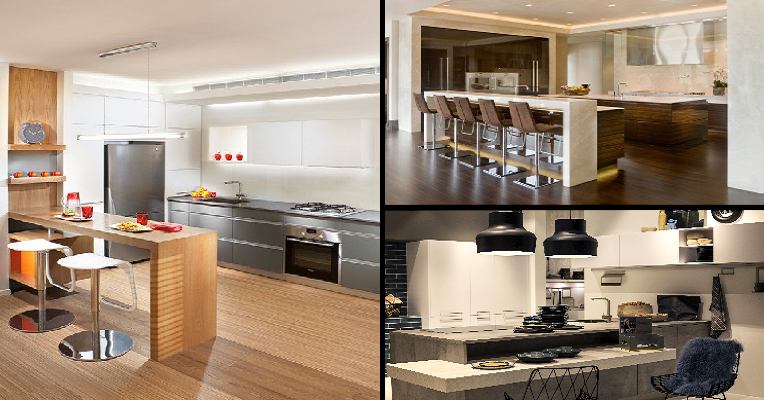 Breakfast bars are getting more common in modern homes and the appeal is understandable as it is not only functional but has awesome aesthetic features as well. It is a truly versatile item to have in your kitchen and can be considerably space saving as well if you don’t have the space for a dining table. Here are some nifty ideas to get you started. This small breakfast bar that is just nice for two or three people is a welcome addition to a tiny kitchen in an open space apartment. The clean lines and bright neutrals create a stylish an elegant atmosphere. Adding wood into an industrial style will add some warmth to your kitchen, just like this kitchen that would look stark and cold without the organic elements. The sleek stools make it look really sophisticated. In this contemporary and classy kitchen, the rustic and sturdy looking breakfast bar addition to the side of the kitchen island adds a nice homey touch to the room. The dark tones of the other furnishings make it look really inviting. Breakfast bars don’t always have to be high to fit in well with your kitchen. You can actually set it lower than your kitchen island for a change and it will look just as gorgeous. Plus, you can use regular chairs when you do so. If you have a kitchen that has huge windows, then placing the breakfast bar facing the window is a great idea for nature lovers as they get to enjoy a gorgeous view of the outdoors while they are enjoying their meal. What other better way to start the day than eating a delicious meal accompanied by a great view? It is common knowledge that marble is a luxurious material and this elegant kitchen is a great example of it. The breakfast bar is made out the same marble material as the rest of the kitchen while glossy wood is used to create a warm atmosphere in the kitchen. If you are really bored of the usual breakfast bar options then you can think out of the box and go for other shapes instead of the usual rectangle. This square breakfast bar is space saving and multifunctional as it can be used as a workstation as well. All the sharp angles not good enough for you? Then consider this cool addition to the existing kitchen island that curves gently and is great for grabbing a quick bite or two. Sometimes even though you already have a dining table, you really want a breakfast bar as it is a really convenient addition to your social kitchen. This open plan kitchen incorporates a sleek breakfast bar near the glossy kitchen counter to make the space look more cheery.